Photo: W.A. Harp House, ca. 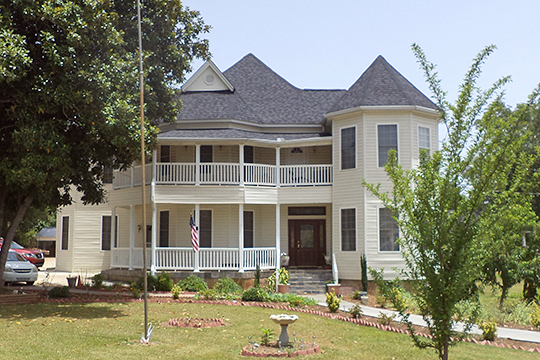 1894, 206 Barnesville Street, Thomaston, GA. Listed on the National Register of Historic Places in 1990. Photographed by User:Michael Rivera (own work), 2014, [cc-by-3.0 (creativecommons.org/licenses/by/3.0)], via Wikimedia Commons, accessed October, 2015. The southeastern section of Upson County was the first to be settled and was once the wealthiest, most cultural, and most populous area in Upson. Logtown Road, from the town of Yatesville to Highway 19 near Flint River, was the main artery of travel through many large plantations. Upson County has a rich cultural history and many remnants of the past are still in existence throughout the County. These are inclusive of many historic cemetery sites where confederate soldiers are buried. Some of these sites include the Auchumpkee Creek Covered Bridge, the Sydney Barron House, the W. A. Harp House, the L. L. Minor Archeological Site, Rose Hill Mill and House a/k/a Hannah's Mill, Upson County Courthouse, The Rock, the Upson Hotel, and the R. E. Lee Institute. Upson County was paralyzed as a result of the Civil War. All of its textile plants and other mills, as well as most of its plantations, were completely destroyed by Wilson's Federal Cavalry in April 1865. In addition, Thomaston suffered a disastrous fire in August 1863, which destroyed the entire business section, with the exception of the Courthouse. A total of thirty-seven business houses were completely destroyed. For this reason, there are no businesses housed in the present business section of Thomaston built prior to the Civil War. Upson County furnished 1,127 men to Confederate armies during the Civil War, many of whom did not return. It was many years before the County began to recover from its terrific losses, but by mid 1870 some progress was being made, particularly in agriculture. Thomaston became the second largest livestock market in the South and was known as the "Mule Capitol" of Georgia. McIntosh Trail Regional Development Center, 2007-2027 Comprehensive Plan: Upson County, The City of Thomaston and the Town of Yatesville, 2008, www.dca.state.ga.us, accessed October, 2015.